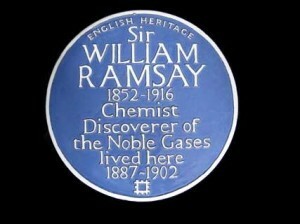 Blue plaque at 12 Arundel Gardens, Notting Hill, London, W11, where Sir William Ramsay (1852-1916) lived, from 1887 to 1902. On Wednesday 9 February 2011, an English Heritage plaque was unveiled at 12 Arundel Gardens, Notting Hill, London, W11, where Sir William Ramsay (1852-1916) lived, from 1887 to 1902. From this pleasant terraced house he would cycle to University College (UCL) to work. The plaque was unveiled at 14.00 by Baroness Kay Andrews, Chair of English Heritage, who spoke briefly about Ramsay; Dr Celina Scott, vice-Chair, described the English Heritage plaque scheme, and Prof. Alwyn Davies, FRS talked about Ramsay’s career and his celebrated cycle rides from Arundel Gardens to UCL. He and Baroness Andrews then unveiled the plaque. Twelve cyclists, led by Dr Andrea Sella (a Notting Hill resident and UCL lecturer who made the original application to English Heritage) then cycled to UCL – it took them 45 minutes on the route used by Ramsay – who wrote to a friend that the journey took him 18 minutes – Andrea pointed out that in Ramsay’s day there were no traffic lights or one-way systems (though the streets were cobbled and pneumatic tyres for bicycles not then been invented). The author of this piece was offered a Boris bike to do the trip, but took the Underground instead. Caricature of Sir William Ramsay (October 2, 1852 – July 23, 1916), by Leslie Ward in Vanity Fair, 2 December 1902. Image available in public domain via Wikimedia Commons. From 15.30 at UCL, in the Ramsay Lecture Theatre, Dr Fred Parrett, Chair of the SCI London Group and Andrea Sella introduced the afternoon’s speakers. 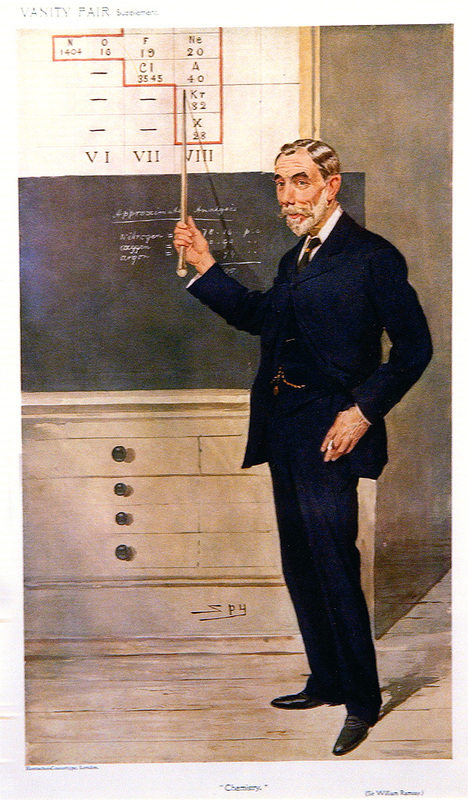 Prof. Alwyn Davies, in Sir William Ramsay – the Man, the Myth and the Bicycle, spoke about Ramsay’s remarkable career. At UCL, where he was Professor of Chemistry from 1880, he isolated, with Lord Rayleigh, the noble gases neon, argon, krypton and xenon, and was one of those who discovered helium. In 1904 he was awarded the Nobel Prize in Chemistry for his noble gas work, the first British scientist to win a Nobel Prize (cf. RSCHG Newsletter February 2005 for an account of the unveiling of an RSC Landmark plaque at UCL commemorating the centenary of that Nobel Prize on 10 December 2004). Dr Neil Todd of the University of Manchester then spoke on Ramsay, Rutherford and Radium. Finally, Professor Bill Brock gave a fascinating talk on Victorian Scientists Living North of the Park: these included A.W. Hofmann (Fitzroy Square), Edward Turner (Gower Street), Alexander Williamson (Euston Road), William Wollaston (Great Portland Street), Sir Benjamin Thompson (Count Rumford) in Cromwell Road and Sir William Crookes (Mornington Crescent, then Kensington Park Gardens). The meeting ended in the Nyholm Room with drinks and, finally and appropriately, haggis and whisky, provided after a short address by Malcolm Grant, the Provost of UCL. This entry was posted in England, Europe, United Kingdom and tagged blue plaque, chemistry, cycling by Bill Griffith. Bookmark the permalink. Professor William (Bill) Griffith is Secretary of the Royal Society of Chemistry (RSC) Historical Group. Griffith was formerly at Imperial College, having graduated from the place many years ago and working for Professor Sir Geoffrey Wilkinson on metal nitrosyl complexes. He then went to Chicago and then Stanford to work with Henry Taube, so he's one of the few people who can claim to have worked for two Nobel Laureates. He has also worked abroad as a visiting lecturer / professor at the University of British Columbia, Vancouver; ETH Zurich; University of Natal, Durban; and the University of Auckland.